Rated 5 out of 5 by akslonetwin from Dawn of Hope This is a rare game in which I actually wanted to play the bonus content. Anytime you mix humans, elves, and dwarves you have got me hooked. Rated 5 out of 5 by judeejuju from Excellent game Loved every minute of playing this game..totally engaging, made me realise how mediocre a lot of others have been lately. More like this one please! Rated 5 out of 5 by 2bees1 from Fabulous Game This game is fantastic. It has a very original storyline, relatively straightforward gameplay, and incredibly hard mini games. In my opinion, this is one of the best games I have ever purchased. Certainly it is the only one I have gone back after playing to review. Rated 5 out of 5 by Robbiexox from A+ Wow!!! What a nice change....MadHead just never goes wrong!!! Forward thinking, fast, interesting subject, right on que with the latest phenomenon of Armageddon,... In my opinion, Madhead is one of the best game developers. You won't be disappointed in this game. Rated 5 out of 5 by braillecode4 from Dawn of Hope Well worth the money. Great game play. Puzzles were difficult and some I skipped. Experts give this one a try. Had everything you want in a HO game. Rated 5 out of 5 by atteckwhite from Excellent thus far.... I noticed this when it was released the other day. Looked interesting so I gave it a go (to be honest, Iv'e only been playing for about 2 hours but i am hooked). The game has a really fresh look about it. Game play is gripping, scenes do not take too long to load and the overall feel is fresh and new. Well done to the developers! Rated 5 out of 5 by Doriane333 from VERY GOOD GAME Very good story, new style, good mini-games not easy, beautiful artwork... wow! thanks for this game BF! Rated 5 out of 5 by Volauvent from Love ya', Mad Head!!! Clap! Clap! Clap! Wow. The games Mad Head is putting out these days are SO COOL! I love the Marvel Comics action play (that's the comic book frames during action sequences) and the new way they are developing the story lines keeps you looking forward to where you're gonna' be taken next. Frankly, I can't say enough good stuff. Oh - and no illogical scenes or lousy animated graphics to break the fantasy. Totally buttoned down. My biggest challenge? Which of the Mad Heads games to vote for as Best Game of the Year. Run .. buy .. enjoy! Rated 5 out of 5 by qetesh71 from Elven Queen This is one of my favorite games so far. 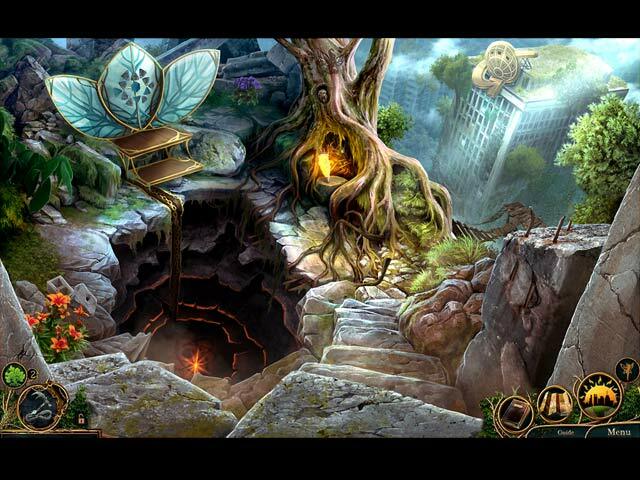 The story line is awesome and the morphing/hidden object are easy to find. Way to go developers :). Rated 5 out of 5 by fulana555 from Well done Excellent game, unique play style. Good length. Rated 5 out of 5 by Granny_Gruff from The Wait is Over I too was privileged to Beta Test this game. I have been waiting for it ever since. Lana is a survivor, a human in a decaying world left from some horrible apocalypse that decimated the human race and left us living in the ruins beside the remnants of the Elvin race. Below where I live with my father, in a school bus on top of a tower of sorts, lies the Forbidden Zone, an area of ruins, poisonous gases, and dangerous situations. Father went to the Forbidden Zone to find something called a Nucleus, an artifact that the elves claim will heal all disease. When Father came back, he was deathly ill. Lana's only hope of saving him is to venture down into the Forbidden Zone herself and try to find the Nucleus. Good stuff: The artwork is amazing, truly a vision of a possible future when mankind has failed to coexist with each other, nature, or our own creations. HOPs are varied and game elements well done. You will have a Rune board that helps with your climbing equipment and has its own special puzzle to complete each time you can upgrade your tools. You will need all the help you can get as you have to climb and rappel from one ruined sky scraper to the next, fighting past man-eating plants and imaginatively placed remnants of the old times, as well as someone who wants to stop you. The story and characterizations were well done and the end of the Demo will make you want to come back quickly as nothing is certain in this ruined future. Bad stuff: It took forever for the Devs to get this game to market, but the beauty and realism of the world they created is breath-taking. Best: Two for one sale. Play the demo by all means. We all know that there are different tastes. I just want to get back to my game! Rated 5 out of 5 by pennmom36 from WHOSE FINGER IS ON THESE NUCLEAR CODES? The world is different now. For hundreds of years, humans have lived beside elves in a post apocalyptic world, a world that is dying. Both human and elven worlds know of the Prophecy that has been foretold by their ancestors, a glimmer of hope, another chance for survival. Legends say that a Champion from the human world will enter the Forbidden Zone to retrieve the Nucleus that will heal the world. Humankind and elves have shared the same ill fates, but will the Nucleus heal the fractured world that mankind destroyed? Is the Nucleus responsible for the ill fates of this post apocalyptic generation? Is the world ready for the Dawn of Hope? MAD HEAD games has done it again! It seem that this dev has been doing some thinking outside the box again, like 24/7 thinking, like professional thinking, their thinking is thinking. What I think I'm trying to get across, is that once again Mad Head has presented us with another game that has an original storyline, one that is fresh and holds your attention. Lately it seems that the demo of most games are difficult to get through because they simply don't hold your attention, and there's no cliff hangers at the end of the demo to make you want to download the rest of the game. Not so with Dawn of Hope, which admittedly has a couple of slow parts in the demo, but the demo ends so well that it would be difficult NOT to download the game to see what happens! You don't get a fuzzy sidekick, and you certainly don't get a fancy electronic tablet or smartphone because in this world, electronics are worthless, unless they can be repurposed for survival. (can you imagine a world without BF games?) You do eventually get a makeshift tool that takes 2 common items and combines them to make a useful tool such as your grappling hook, after playing a Mini Game of course. In this collector's Edition, most of the scenes have a hidden Elven Fairy to collect, a handful of Achievements to earn, and a Morphing Object within the HOP's. The Hidden Object Scenes are a wee bit disappointing, because usually this dev incorporates unusual themes within unusual scene locations. Most of the HOP's are interactive list finds but there are variations such as Spot the Difference, finding recipe items, finding items with a beam of light and finding items that match a black and white photo. There are also a few Zoom Zone scenes, and most HOP's have a Morphing Object. The Mini Games are fairly easy for the most part. Below are brief descriptions of the games you'll encounter during the demo: 1) Each time you use your grappling hook, you will play a few interactive mini games where you throw the hook at targets specified, or stop the targets when they are in the green zone of the meter. 2) Place ropes in the correct order using the existing pattern as a guide. 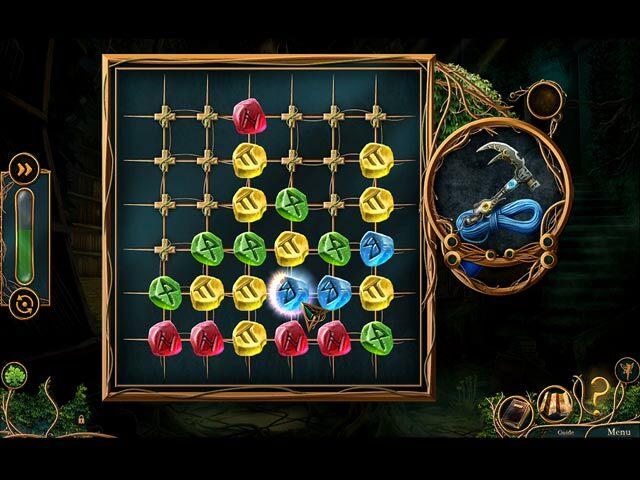 3) Match 3 variation game removing all runes by swapping runes strategically so no rune remains on the board. 4) Blocks variation where you select and move obstacles to clear a path for the trolley. 5) Select radio knobs to arrange notes according to the picture shown. 6) Move the doors and rotate or slide tiles to complete the images. This Collector's Edition has 16 Wallpapers, 10 Music Soundtracks, 14 Achievements, 18 Hidden Object scenes, a Collectible Hunt game, replayable Rune Games, Jigsaw Puzzles, a Character Gallery, a built in Strategy Guide and a Bonus Chapter, enjoy the game before the world stops spinning! Rated 5 out of 5 by farmguys from DAWN HOPE - Loved this game immediately It took less than 3 minutes of test play to convince me that this a great game. I'm really impressed because I usually play at least 20 minutes before deciding to buy a game. The music, the story line, graphics ....everything about this one says it's going to be an enjoyable experience. Rated 5 out of 5 by gryhndlvr from Outstanding game Mad Head has done it again with this game. This is exactly what I love about these devs. Fantastic graphics and colors, draw you in storyline and unbelievable imagination. I love how you have to zip line through the areas, somewhat getting stressed out because you are being followed at the same time, ha. This reminds me a bit of Avatar. You have the future world in shambles but living in a story with elves. Great combination. Map, collectibles and morphs. Mini games are just what I like and the Hops are fun to play. You need to play a little match 3 game when combining certain items. So much fun. This is a definite buy for me. I have so been waiting for a different game that keeps my interest and draws me in, this one does!! Rated 5 out of 5 by LogieBaby from It's been a long wait for this gem Many months ago I was asked to beta test and survey Dawn of Hope. It generally doesn't take as long as this game did to become available. However, as the old saying goes: "Good things come to those who wait" In a few words I gave a glowing review in my survey. The many months it took to release Skyline Adventure has not diminished my enthusiasm for it. Our heroine must find a lasting cure for a disease that has nearly killed her father. To do so she must travel between the human and elven worlds to make dad whole again., She is assisted by an elven mechanic and is apparently thwarted by a human wearing a gas mask called the Wanderer. Somehow I feel the Wanderer is one of the good guys. There is a device called the nucleus that if properly used can rid both worlds of disease for all time. The elven queen convinces the daughter that if she can unravel the secrets within the nucleus, all will be well. At the demo's end it becomes somewhat clearer that the queens intent for the nucleus is geared only to the world of elves. Graphically Dawn of Hope is one of the best drawn game in a very long time as so many items and also the characters seem lifelike. The player gets to use a magical grappling hook to evade the Wanderer and get closer to where the nucleus is housed. 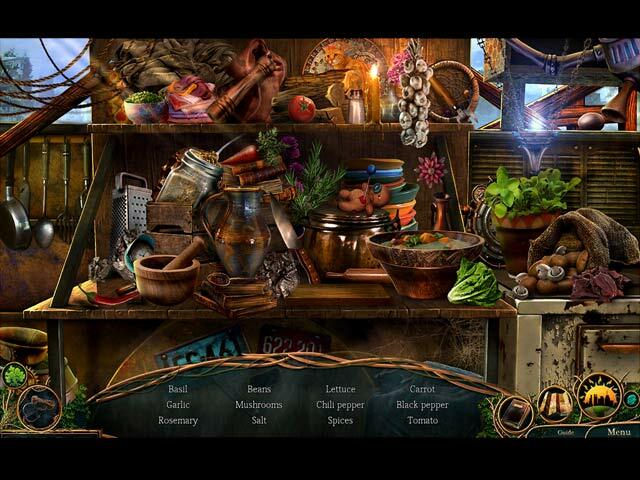 A portion of the hidden object segments are very clever as well as being interactive and the puzzles ( although seen in prior games ) do offer some challenge. For those who enjoy finding collections Skyline has them. The look and feel of the game makes it a sure fire buy for me and I wholeheartedly endorse Dawn of Hope. Rated 5 out of 5 by biscuitsmama from CAN YOU FIND THE ARTIFACT AND HEAL THE DEVASTAION IN A DYING POST-APOCALYPTIC WORLD? From a developer who is now emerging as one of the most creative and innovative producers of casual games comes Dawn of Hope Skyline Adventure, an exciting sci-fi/fantasy blend that is sure to please gamers who have been clamoring for something different. At least for me this game represents the best of both genres so I knew it would be an instant purchase. In the opening cutscene the elven queen tells her people that since the time elves have started living along side of humans they have shared the same ill fates. The world is dying but there is hope: a prophecy that a champion from the world of humans will enter the forbidden zone and bring the queen a special artifact that will allow the queen to heal both worlds. The queen had hoped that Lana’s father was their long-awaited champion but he failed and the queen now asks you to take up the quest and succeed where he did not. You will play the game as Lana who is now trying desperately to save her dying father who returned from the “forbidden zone” in the lower world, after failing to find the artifact. Those who remain in the world now live “above” – in the trees and higher plateaus far from the destruction that once took place below. Will you be able to succeed in finding the artifact and save both your father? Face seemingly unsurmountable obstacles as you take up the quest to find the Nucleus and play through this wonderful new HOPA game. Something I love about this game is that the artists have been able to create awesome graphics that depict the decaying “forbidden zone” without every scene being totally drenched in tones of gray, brown, and black. Although the world below is dreary, there is still some brilliant color in the scenes as well. The voices are wonderful and with the overall sound package make the game see realistic. I was so immersed in the game that when the demo ended I knew that I had to keep going. The game tools include an interactive map but you also receive a magic rune table from your father’s friend Coop. This special cube will help you create or repair items by combining parts of other items after you play a mini-game to clear the runes from the top of the cube. A gimmick, of course, but I rather like this one. The HOPS were well-designed and very interactive. Lately, I have become a bit bored with some HOPS that seem to require a bit too much interaction but I actually enjoyed these as they are very creative. The mini-games were not difficult but maybe that is because I happen to enjoy the ones found in the demo. As we all know, the puzzles inevitably become more challenging as the game progresses but at least you can hit the skip button if you don’t want to solve them. If you enjoy the CE version of games, this one includes the following extras: there are 32 collectible fairies and 18 morphing objects to be found, and also 14 achievements to earn. The standard extras include the bonus game, strategy guide, 16 gorgeous wallpapers, soundtrack, and a Rune Game. Recently we have seen several excellent games from this developer and now I find myself eagerly waiting for their next release. 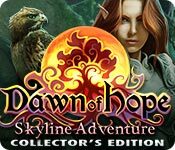 Dawn of Hope Skyline Adventure shows that fantasy and sci-fi fit nicely to create a new type of game that I happen to love. The storyline is excellent and the gameplay moved smoothly through the storyline to present a game that I find very entertaining. Since the game was an instant buy for me, I need to post this review and get back to playing. As always, please try the demo to see if you will enjoy this game as well. Rated 4 out of 5 by Majestyx12 from I had a memory relic too aka VCR tape. 6 Chapters + Bonus. If you collect all the fairy symbols you unlock the ultimate hop. Morphing objects just in hops. Hops are fun. Humans, Elves and a Dwarf. All are back in the Bonus Chapter. I couldn't picture myself as lead hero because of all the throwing and climbing. Great Game, I Liked it. Rated 4 out of 5 by kevsters from Different, but good This game was a mashup of post apocalyptic and fantasy genres. I was looking for something different with the elves, but found this okay. The puzzles were a bit difficult, although I must admit that I was playing while recovering from a cold. If there is a sequel, How about Coop getting married? Who wouldn't plunk down some coin to see Coop and his loovely bride??? Ho ha ha, ha ha ha ha ha!!! Rated 4 out of 5 by cuorips from A nice premise. I liked the idea of a destroyed world, abandoned buildings, old remainings of a civilization. Great idea, I wish we had more of that, it is a good creepy idea. Unfortunately with those Disney Land colors, it became fast an enchanted world, like a fairy tale, so the entire idea sort of shifted and I got bored again ! But good job anyway, a very nice game. It is just that it did not go in the direction I wanted it to go. Bummer ! Rated 4 out of 5 by theswede from tarzan would envy this game different for sure man destroys cities and earth you live on a roof top cause it's way to dangerous on ground !!!! like the story art/graphics where good. mini games where good and in the end every body is in harmony . Rated 4 out of 5 by kateblue222 from Great game but no replayable minigames I will not write a long review because others have already written great ones. Great art, music, good story, fun! I want to keep playing and will buy the CE. But it's missing one thing. You can't play the minigames over. Even though you can play the HOPs over, and there is a "rune game" and a jigsaw puzzle, no ability to play the minigames over! ???!! I particularly liked that first one where you lined up the colored lines. I don't get it. Grading down for this! Come on devs! I'm buying the CE, though. Excellent game. Rated 3 out of 5 by Yurnmesis from More For Mini Fans! Well-crafted game with excellent graphics. Overall: Excellent graphics, sounds and music. Great characters.Nothing new on story line, save father, save the world. Great Hidden Object Games but more Mini Games than HOG. Way too many Mini Games; it became annoying. For such a well-crafted game in all other aspects I was very disappointed to be forced into so many frustrating Mini Games. Sadly welcomed the skip button. Now if you are a Mini fan you’ll love this one. The hint could have been a little faster because of the lack of clarity as to where and what to do with items picked up. The game was rather short and the ending predictable but at least with a good closure and no left questions. I haven’t completed the bonus game, but will probably go back another day to finish it. I would have given this a solid 4 but with so many Mini Games the fun factor plummeted. Graphics: Excellent plus. Sounds: Very well done. Music: Enjoyable. Characters: Well done, good voice overs. Hints: Could be a bit faster since many of the objects were unclear as to where they went and what to do with them. Map: Didn’t use. HOG: Excellent and very well developed. Mostly clear objects, but a few in dark. Mini: Not a fan of Mini Games. This was honestly a horrible experience. You get a “grapple” that requires upgrades and each time you must do a Mini Game to improve your “grapple” skills. Now where have I seen grapples before? I found the Mini Games annoying because there were so many and was happy when the “skip” button appeared! Morph/Collect: Only if I happened to click on one. I just wanted to finish this. Rated 3 out of 5 by Kantata from Not Madhead's best. I bought the game without trying the demo because Madhead is my absolute favourite studio. Between Nevertales and Beyond, they've crafted some of the most unique and enthralling hidden object adventures I've played in my life. But this one just... fell kinda flat. It didn't quite feel like the same people made this game, to be honest. The story didn't make a lot of sense to me; it just seemed kind of piecemeal, like someone let their kid come up with the story idea. The music was nice but seemed to borrow heavily from their other games. I love the music Madhead uses, don't get me wrong, but each game usually has its own kind of theme, and this one didn't. Was a little put off by the sudden romantic development. I'm all for romance in games but this one just made me squirmy. It was kind of awkward. Maybe it was because I wasn't enjoying it as much as I expected, but Dawn of Hope seemed shorter than other Madhead titles. I played through the entire main game and bonus game in one evening, finding all of the morphing objects and bonus items. I guess my overall impression is that they just threw this game out there while focussing their real attention on a bigger/better project. I could be wrong; that's just how it felt to me. It didn't seem crafted with their usual meticulous care and passion. I actually do recommend this game, but I'd wait til it goes on sale.